Unique building solves unique problems. Project wins award based on architectural, innovative and technical factors. 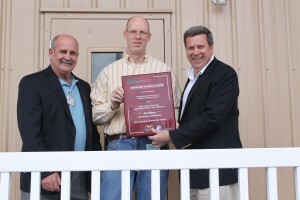 Dominion Power of VA was honored today by Wilmot Modular Structures, Inc. Wilmot won 1st Place in the Modular Building Institute’s Awards of Distinction for the design and installation of Dominion’s building in the Category of “Relocatable Modular Office Over 5000 SF”. 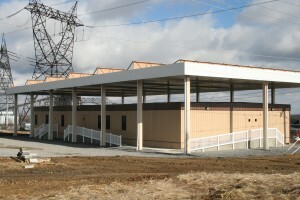 The Switch Yard Personnel Building located at the Mount Storm Power Station was designed and built this year to accommodate Dominion’s personnel working in harsh environmental conditions on that site. Wilmot’s building team with the support of Dominion Power devised solutions for dealing with several issues. The first challenge was to develop a system that could withstand 1-2 pound missiles, ice shards, that form on the power lines during the winter months and fall at 120 mph or more. The second challenge involved the coordination of tying into the existing grounding system – a dangerous and critical step that if done improperly could result in death or serious harm to site personnel or employees. In the end, Wilmot and Dominion were successful in finding a design that could stand up to heavy abuse, extreme climate changes and potential water infiltration issues into the structure. Congratulations to Dominion Power of VA and Wilmot Modular Structures for their recognition from the Modular Building Institute!